Today, while waiting for Jeff in the parking lot of the Mt. 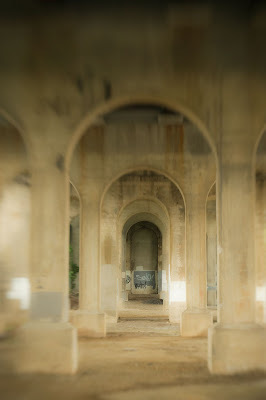 Washington Church, I made a few shots under the Smith Avenue bridge. This was my favorite. I used the Lensbaby Composer, processed the image in Photoshop and added a Topaz Simplify2 filter. When Jeff arrived, we headed to Beth Am Synagogue to make a few more images, for their publications. I missed Barb, she had an idea to shoot the old Synagogues in town and I first visited Beth Am with her.....just can't belive I will get no more e-mails to check out her site for the images she just processed and we won't talk about the shots we made.....there will be no more laughter over the goofy things we did. Sad! She was a great photo pal and friend who will be forever missed.